Kim Arnold spent eight years checking in and out of hospitals with her sick son. Then he died, and she knew she had to become a nurse. One of the multistory art deco murals that once covered the Phoenix Midtown apartments on Mockingbird Lane pictured a couple in a beatific, closed-eye embrace. The couple is a real one, Kim and Chris Arnold, who have known each other since their days at Booker T. Washington High School for the Performing and Visual Arts. Chris’ company, Eyecon Studios, painted the mural. Looking at it, you would have never foreseen the tragedy the young couple would face as parents. After they married, Kim became pregnant with triplets. The three boys—Andrew, Matthew, and Nathaniel—were born nearly three months premature, each weighing between 1.6 and 2 pounds. Andrew and Matthew spent about half a year in the neonatal intensive care unit (NICU), but it was Nate who was the most unstable. He spent his first eight months of life there, trying to develop the anatomy he was supposed to grow in the womb. He left the hospital with a tracheotomy vent and a feeding tube because his esophagus wasn’t ready to breathe or eat. Kim had been a sign language interpreter and worked in commercial real estate, but she had to stay home to help care for the boys. “It was my full-time job to learn everything I could,” she says. While Andrew and Matthew eventually grew out of their need for constant visits to the hospital, Nate didn’t. He suffered from chronic lung disease and made frequent visits to the pulmonology floor. He would often pull out the tube that allowed him to breathe through a hole in his neck, forcing Kim to have to perform CPR to resuscitate him. On one occasion, her phone lay in the other room as she rushed to squeeze the bag that was keeping oxygen flowing through his body. She made the impossible choice to run to her phone and call for help while her toddler lay in his playpen without oxygen, his face turning blue. Nate survived, but Kim had to remain vigilant. At one point, he spent four months in the intensive care unit (ICU) after getting respiratory syncytial virus (RSV), which causes coldlike symptoms in most children but was life-threatening with Nate’s compromised immune system. During the hospital stay, Kim went for a walk with Marita Thompson, the ICU physician, and they had a frank conversation that would change the direction of both her life and her son’s. They discussed what it would look like to end medical treatment for Nate. Hook ’em: Nate loved the University of Texas Longhorn Band, and the triplets (Andrew, Nate, and Matthew left to right) were able to join the band and Bevo on the field during a UT football game. Her mix of dry humor, expressive energy, and fierce care for others made Kim a popular parent at the hospital. She was put on advisory panels to give feedback about everything from the workflow to paint colors at the hospital. She helped other families navigate the insurance maze to get their children the services they needed. She reassured them that life would continue even if their child needed complicated medical care. Kim’s volunteer work benefited the hospital, but it was important for her as well to deal with monotonous periods of waiting. “I was doing something to keep my mind occupied, and I felt like I was making a difference,” she says. When he was 6, Nate became eligible for a double lung transplant. The family hoped this would bring some stability to his life, though they knew it wasn’t a permanent fix. Transplanted lungs have a life span of about 10 to 15 years. Kim and Nate moved to Houston for six months so Nate could receive the new organs. It was while the family was in the hospital for the transplant that Chris first mentioned to Kim that she would make a great nurse. But he wasn’t the only one. Their pulmonologist would ask her when she was going to come work for him. “When you can keep him out of the hospital,” she would shoot back with a grin. After the transplant, the family began to focus on quality of life for Nate. 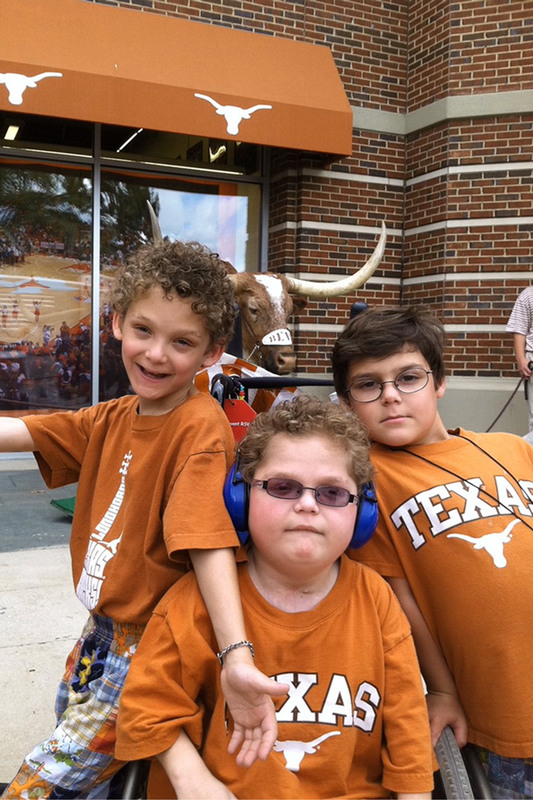 They went to Disney World with the Make-a-Wish Foundation, and, as a huge fan of marching bands, Nate spent time on the field with the University of Texas Longhorn Band. “He wasn’t sure why those people ran around on the field between the bands playing,” Kim says. Nate and his identical twin brother Andrew, who is on the autism spectrum, were always chatting back and forth, Kim says. Matthew is developmentally typical and helped care for his brother by bringing him what he wanted even when Nate couldn’t express it clearly. Nate had a wicked sense of humor and, even though he was often confined to his bed, would tease his brothers. “Nate was a wild one,” Kim says. Considering her own accumulated experience and newfound but bittersweet free time, she made a plan. Just months after Nate’s death, she enrolled back in school to get her nursing degree. When Nate was 8, he woke up one summer morning and his heart wasn’t beating normally. Kim and Chris rushed him to the emergency room, and he was sent to critical care—not a good sign. “There were way too many people in the room, way too many familiar faces looking too worried,” Kim says. The medical staff knew this was the end. The doctors and nurses who had cared for Nate over the months and years came by to see him. His death was quick. “If you have to go, that is the way to do it,” Kim says. It would be understandable if this mother who had to spend nearly a decade in the hospital with her children would want to walk away from Children’s Medical Center Dallas and pray she never had to enter again. Instead, Kim looked back at all the time, energy, and knowledge that the staff had put in to caring for her son. Considering her own accumulated experience and newfound but bittersweet free time, she made a plan. Just months after Nate’s death, she enrolled back in school to get her nursing degree. “I knew the only place I wanted to work was here,” she says of Children’s Medical Center Dallas. It had been decades since she was in school, but with a goal in mind and her own bank account paying for the classes, she found that she was a better student the second time around. As the eldest one in her program at UT Arlington, and with her firsthand experience in the medical field, Kim took on a maternal role that she embraced. After her clinical rotation on the cardiology floor at Children’s Health, she knew she had found her focus. I can’t imagine not coming back here, she thought. This is clearly where I belong. With support from her family, she graduated and earned a job on the cardiology floor at Children’s Health. It was similar to the pulmonology floor, with chronically ill children and stressed-out families, but it wasn’t too close to home. Kim has been in her role for two years now and, after rotating between night and day shifts every three months, will permanently be on days—a welcome change. While it may seem like she has finally achieved her goal after more than a decade’s journey, Kim says she is only getting started. “I have the world to conquer. I would love to be comfortable enough with my own practice to help new nurses. I want to know everything, and there is always something to learn,” she says.